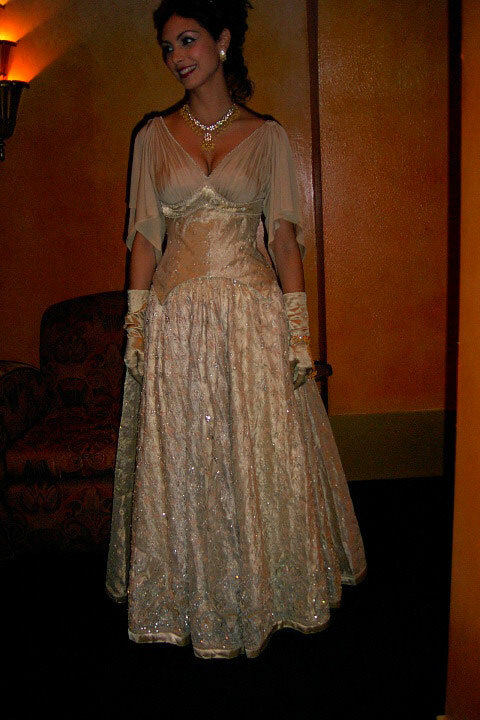 I’ve only worn this dress once, for the 2010 Dragon*Con Whedon Costume Contest and I won Best of Show!! My first big time costume award! The top was drafted by me, but I can’t wait to improve upon the design and maybe make it a tad longer. The screenshots I used from the show did not show the seam placements, so i had to guess. The skirt fabric was the most challenging. I ordered a heavily embroidered silk and added the rope embroidery to the hem myself. I also attached hundreds of pearls and rhinestones to the entire skirt. It was quite an undertaking. The Bollywood jewelry was found on ebay and pictures of the real jewelry can be found at the Costumer’s Guide.